With gas prices hovering around $4 a gallon and what seems an entire generation shunning automobiles, it's no wonder that bike commuting has seen such a resurgence in recent years. But for all the physical and environmental benefits riding imparts, it nevertheless leaves you a hot, sweaty mess. That is, of course, unless you get your bike to do the pedaling for you. A2B bikes is the American arm of the HERO Eco Group, which has been making electric bikes for Indian and European markets since the turn of the century. The A2B lineup boasts five models with a variety of pedal assist and throttle options to minimize commuting effort. I recently took a ride on four of the models at A2B's showroom in downtown San Francisco. The Shima's 500W wheel-hub propulsion system provides a roughly 37 mile range per 5 hour charge of its 36v 13.2ah Lithium-ion battery. That battery slides in and out under the rear deck and can be locked in place when you park. Three levels of pedal assist—economy, standard, and speed racer—provide up to 35 Nm of torque and propels the rider to speeds approaching 30 MPH. It's 7-speed Shimano gear set is relatively short and with the pedal assist at max, I routinely beat traffic off the line and passed other riders with ease. It felt like I was perpetually riding downhill. The Shima retails for $3,800. All of the models include integrated head and tail lights and are all currently available. The Alva is another pedal assist model, designed for comfort where the Shima was built for speed. Its 36v, 13.2ah Lithium-ion battery drives a 450W brushless hub motor to reach speeds of 20 MPH and a range of 20 miles. While the Shima's pedal assist was powerful enough to get off the line without too much trouble, the Alva takes a more on-demand approach. 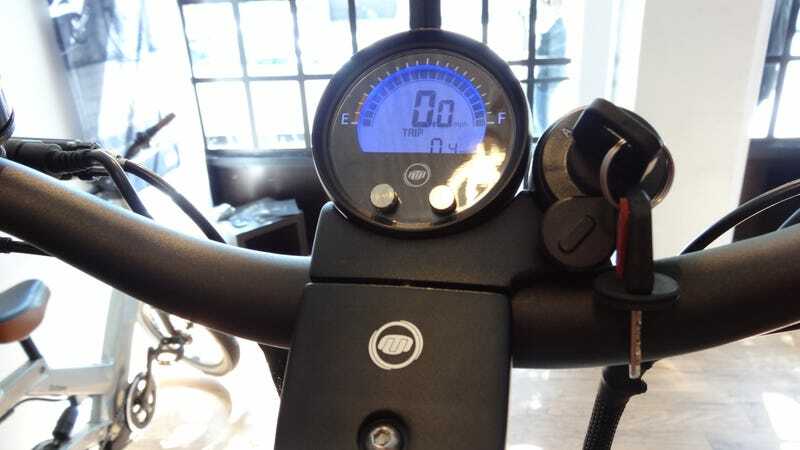 Located just under the bell on the left handlebar, there's a rocker switch that manually engages the motor without requiring you to push off or pedal start. That way you get a little bit of speed going before you start pedaling and eliminates the need to huff and puff through the first two gears. The Alva will set you back a $2,600. The Alva+ takes the features that made the Alva so popular in Europe and recalibrates them for lazy Americans. It offers pedal assist like its predecessor but upgrades the start button into a full-on throttle integrated into the right handlebar so you'll never have to pedal through the low gears. The Alva+ tops out at about 20 MPH under just throttle power but when you start pedalling as well, you can reach about 24 MPH, easily keep pace with city traffic over the bike's 37 mile range. The key fob security system—needed to turn on or adjust the power assist level—is ingenious as the A+ weighs a 66 pounds and challenging to ride without it. They may take your bike, but they won't get more than a few blocks with it. The Alva+ costs $3,400. Kyle Langdon, A2B's Business Operations Manager, described the Octave as the Escalade of E-Bikes. The man does not lie, the Octave is downright luxurious—like a Beach Cruiser you don't have to pedal. See, the cranks are set forward on the frame far ahead of the seat, like a Cruiser. This eases the rider into a more upright and comfortable sitting position, almost like a recumbent. Sure, that position makes pushing hard with your legs nearly impossible but it does not matter because you won't actually be doing much pedaling. I rode this bike for a good 20 minutes and pedaled none times—Zero—I just kept grabbing handfuls of throttle instead. The primary battery is located internally and delivers 15-20 MPH and 20 miles of range, though it can be augmented with a secondary battery on the rear deck, which boosts range to a possible 40 miles. It, too, runs $3,200 to $3,500 depending on options.